Our group leads a team of international collaborative partners from the National Superconducting Cyclotron Laboratory at Michigan State University, Howard University, Tokyo Institute of Technology, NASA Goddard Space Flight Center and NASA Jet Propulsion Laboratory. This ambitious study is the first well-calibrated fundamental energetic heavy ion interaction investigation with reduced dimensionality systems, and is varied across a full spectrum of heavy to light ion species with different charge-to-mass-ratios, including Krypton-86, Krypton-78, Calcium-48 and Oxygen-16. Utilizing the multidisciplinary expertise of our research group we are developing a complete picture of the fundamental physics of radiation coupling in reduced dimensionalities. In Multiphase GaN Nanowires Our group reported the first investigations of the radiation response of the novel multiphase GaN nanowires discussed above . 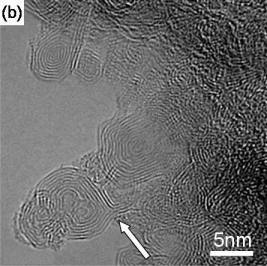 In this investigation we observed an interesting radiation coupling effect, where highly localized plumes of amorphitization were observed near the nanowire surface. This differs from the conventional semiconductor material ionization mechanism of microns-long linear tracks. 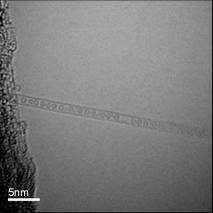 No long tracks were observed in any direction within the nanowire. Also, no propagation or accumulation of defects at the zinc-blende/wurtzite interface has been observed to date, which has positive implications for device development. In SWCNTs To date our research in single walled carbon nanotubes confirms the high radiation resiliency phenomenon reported by other groups, for high and medium-Z heavy ions with energies comparable to galactic cosmic rays. We achieved the longest cumulative energy deposition in single walled carbon nanotubes reported to date: 170,000 Grey, > 2 hours of continuous heavy ion irradiation. Slight shifts in Raman spectra have been observed and reported that provide clues to actual radiation coupling in this very resilient system. 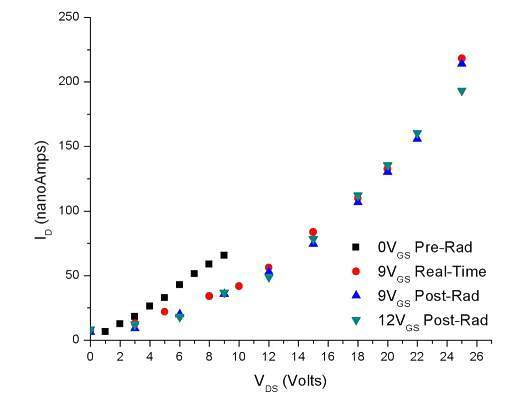 We have made the first observation of C60 formation within single wall carbon nanotubes ("peapods") induced by heavy ion irradiation rather than electron irradiation . These results provide intriguing quantitative information about possible heavy ion interaction mechanisms with nanomaterials, which we are currently working to interpret. In Carbon Onions Carbon onions are a less known carbon nanomaterial with very promising applications in tribology, including excellent performance in vacuum conditions. As discussed above, carbon nanotubes, a closely related form of nanofunctional carbon, have demonstrated inherent radiation resiliency and have been identified as a candidate material for space applications. Therefore, carbon onions may also have high resilience to heavy ion radiation, and their tribological performance can be scrutinized for use in space applications. We found that carbon onions retain structural integrity after heavy ion irradiation, but changes from smaller spherical to larger polygonal shapes were noted. This change exactly corresponds to the shape changes observed when the growth temperature is increased from mid-range (1700-1800°C) to high (2300-2400°C) in a non-radiative situation. This phenomenon is known to correlate with a reduction in sp3 defects in the sp2 lattice, which implies possible radiation-induced annealing of the graphene lattice. An improvement in tribological properties is also observed for carbon onions grown at the higher growth temperatures. The radiation interactions may actually change the carbon onion structure in ways that enhance rather than diminish their tribological performance .